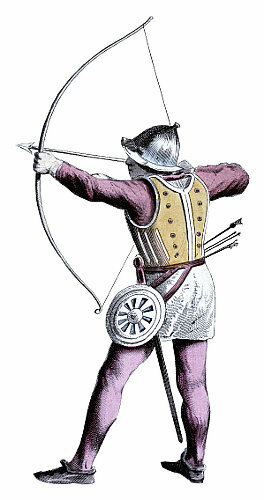 A soldier from “Three knights from the 15th century” without the background or border. This man is holding a bow and arrow, drawn and ready to fire. He has more arrows tucked into his belt; he also has a sword and a small shield. He wears a shiny metal helmet, a yellow hauberk or vest, probably also metal, and wears a chainmail skirt held up with a leather belt from which is slung the shield, sword and arrows. He wears a pink shirt under his hauberk, and also pink host (tights), and fashionable shoes. He is the very darling of every 1450s army. See also the brown infantryman and the blue pikeman.